Welcome to the Fresh Coast Weddings blog! Fresh Coast Weddings is dedicated to guiding & inspiring brides as they begin to plan their destination wedding along Michigan's beautiful West coast! On the website you can learn about the beach towns, explore lake shore venues & find the perfect vendors! Here on the blog, you'll find inspiration from real weddings, planning tips and info on our fabulous venues & vendors. 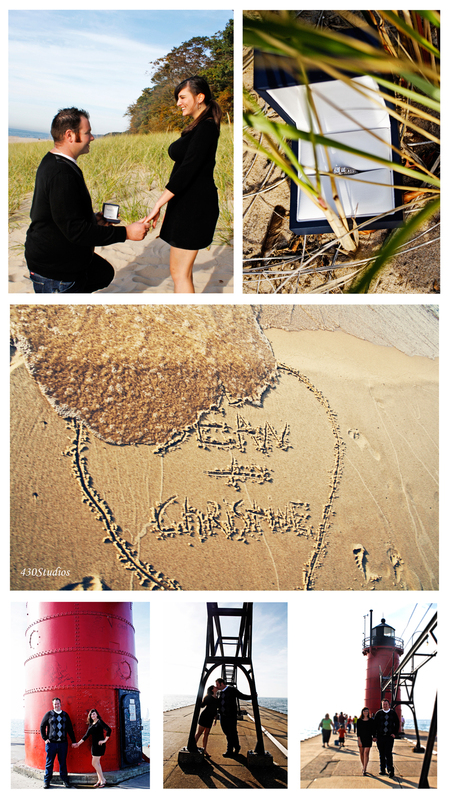 Brittney Massey of 430 Studios shared this Lake Michigan engagement-inspired engagement session with us! The bride and groom took their engagement pictures in Saugatuck, and reenacted their proposal in the exact spot where it took place. Not only that, but it’s the same spot where the couple will tie the knot later this year when they say ‘I do’ at their Lake Michigan wedding! So sentimental and so sweet. I love to hear stories of couples who come in from Chicago, Indy or Detroit, and really embrace the lake shore as “their special spot.” Not only do they tie the knot here in Southwest Michigan, but they start the ball rolling by popping the question on the lake shore as well! How special to have a place that holds so many great memories—the spot where you got engaged and tied the knot, can be your special vacation spot for 5, 10, 15, 20 years to come! Find your “special spot” by exploring West Michigan beach towns on the website, and finding that prefect Lake Michigan venue!